The versatile fishing waters of Peurajärvi are situated on the border of Nurmes and Sotkamo and offer a wide variety of options for all sorts of anglers. The area contains over 200 hectares of lakes, ponds and small rivers where anglers can find rainbow trout, pike and pike-perch, among other species. The comprehensive services available at Peurajärvi ensure an enjoyable fishing trip or cottage holiday with activities such as hiking, berry picking and even hunting. The most enthusiastic nature lovers should also pay a visit to the Hiidenportti National Park, which is a hiking distance away from Peurajärvi. In the clear waters of Iso-Valkeinen one can catch rainbow trout that is planted into the lake fully grown. The other waters in the area offer pike-perch, perch, pike and whitefish. 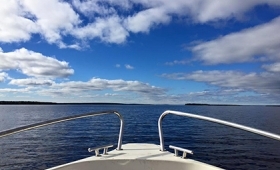 Urtti-Valkeinen is the area's specialty destination that is reserved solely for torch fishing and harpoon fishing during the open water season. Experience the fascinating and exhilarating atmosphere of torch fishing or relax while catching rainbow trout in the clear fishing waters of Peurajärvi. Fishing period 1.1.–5.6. and 8.6. (3:00 PM) –31.12. Fishing is prohibited in Peurajärvi during 6-8 June 2019, until 3 pm, due to children's fishing event Angling Day. All persons under 18 years of age receive a 50% discount on the permits and persons under 15 years of age are allowed to share the same fishing quota, with the permission of their parent or legal guardian. For fishers under 15 years of age who intend to fish alone, a one week's fishing permit is available free of charge at the Eräluvat online store. A family permit is also available for this destination. In this context, a family consists of children under 18 years of age and their parents/legal guardians. Married couples and couples in a civil union may also purchase family permits. The family permit costs twice as much and its fishing quota is twice as large. Note! 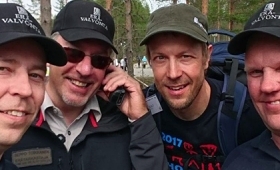 The Peurajärvi area has poor mobile phone reception, which may at times interfere with mobile permit purchases. destination. The call must be made from a Finnish mobile subscription. Read the licence terms of Metsähallitus. Fishing period: 1.1.–5.6. and 8.6. (3:00 PM) –31.12. Fishing is prohibited in Peurajärvi during 6-8 June 2019, until 3 pm, due to children's fishing event Angling Day. The permit grants the right to lure fishing (lure, fly, jig), hook and line fishing and ice fishing. A separate angling permit (Peurajärvi 7510) is required for the Lakes Iso-Valkeinen and Urtti-Valkeinen. General fishing rights (hook and line fishing, ice fishing, lure fishing under the fisheries management fee) do not apply to Lakes Iso-Valkeinen and Urtti-Valkeinen by decision of the North Karelia ELY Centre (POSELY/1345/5710/2015). The purpose of the decision is to secure the economic use of fish stocked into the lakes. The angling permit for Southern Finland (7413) grants the right to fish in the other waters in the area where general fishing rights (hook and line fishing, ice fishing) also apply. Lure fishing is also permitted in these waters with the payment of the fisheries management fee. All natural baits (worms, grubs, bait paste, etc.) and artificial lures are allowed at Iso-Valkeinen. Torch fishing, bowfishing, harpooning and scuba fishing is the only allowed fishing methods at Urtti-Valkeinen during the open water season, and in the winter season the lake is reserved for ice fishing. Other forms of fishing are prohibited. Torch fishing, bowfishing, harpooning and scuba fishing are prohibited in Lake Iso-Valkeinen. In the winter, each angler may use up to two rods and lines when fishing from the ice (one of these must be a tip-up). During open water season each angler is allowed one rod and line which must be within the anglers reach at all times (max. 2 m away from the angler). When trolling without a motor, each angler is allowed 2 rods or lines. Leaving the rod to fish by itself is prohibited. The use of an own boat is permitted in Lake Iso- Valkeinen and Lake Urtti-Valkeinen. Boat storage is only permitted at the boat harbour on the eastern shore of Iso-Valkeinen. The boat must have its owner's contact information in a visible place. Fishing with a motor (including electric ones) is prohibited in Lake Iso-Valkeinen and Lake Urtti-Valkeinen. 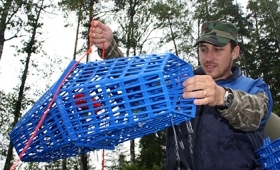 It is also possible to hook fish, torch fish and bowfish in Peurajärvi and Mäntyjärvi with the Ylä-Karjala/Ylä-Savo trap and net fishing permit (7001). Note! If you are actively ice fishing (i.e., fishing with a rod) while simultaneously having a tip-up on the ice, you must have paid the national fisheries management fee. There are no catch quotas for whitefish. The right to fish ends when the angler has caught enough fish to fulfil the permit's fishing quota. Once you have finished fishing, you must submit a catch report at www.tuikki.fi. All caught and released fish must also be reported. Note! The angler may catch up to 3 salmonids / day(00:00-24:00), regardless of the type of permit or number of permits they have. No minimum catch size for rainbow trout or whitefish. 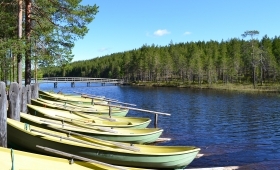 Metsähallitus has 5 row boats in the area that may be rented. Rental prices: €15 / day or €45 / week. For boat rentals and keys, contact Reijo and Tarja Piiroinen in Saramo. Keys may be picked up daily between 9 AM and 9 PM. Reijo tel. +358 40 752 6141 and Tarja ( At 5 PM to 9 PM) tel. +358 40 752 6153. Storing your own boat in the area costs €20/year. Boat spots are provided by Konesola in Nurmes, tel. +358 13 480 180. 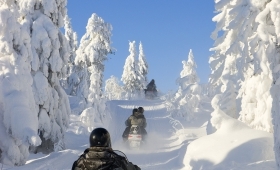 Peurajärvi cabins offer lodging and there is one big cabin for a large group. The area is also covered by a comprehensive trail network and there are lean-to shelters, campfire sites and a cooking shelter as well as caravan spots. There is also a trail that leads to the Hiidenportti National Park. Catch-sized rainbow trout is stocked into Lake Iso-Valkeinen four times in March–April and then again every 2–3 weeks between August and September and before Christmas. The area's lakes and ponds are also stocked annually with whitefish and pike-perch.